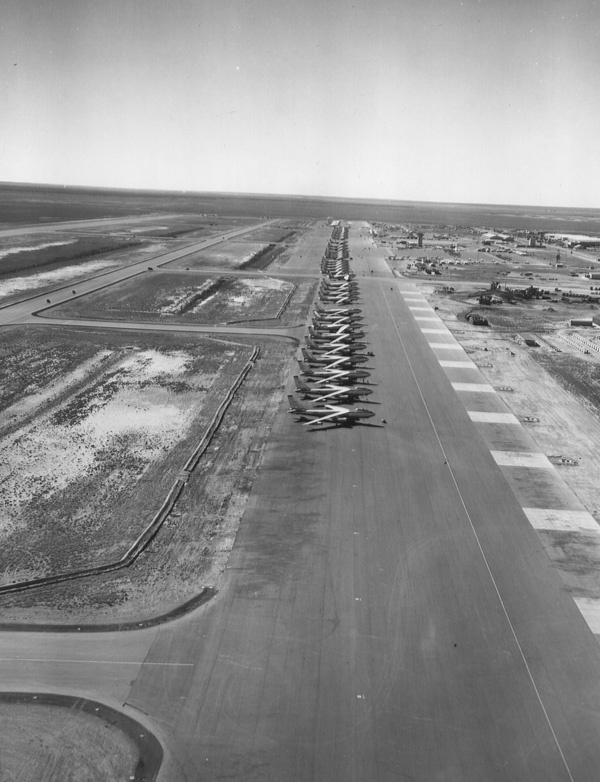 B-47s strategic bombers parked at Sidi Slimane around August 1954, several years before the January 1958 accident where a bomber caught on fire and a nuclear weapon was destroyed. (National Archives, Still Pictures Division, RG 342B, box 1479). The Cold War ended several decades ago, but the U.S. government continues to keep secrets from that era under lock and key. Some secrets remain valid, but some of the secrecy serves no useful purpose. 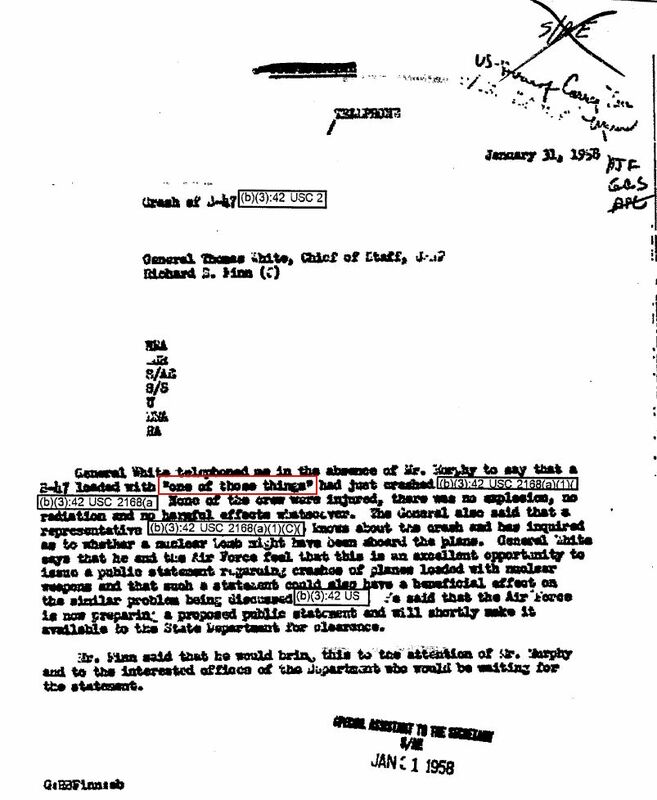 One pointless secret concerns a January 1958 nuclear weapons accident that took place at a U.S. Air Force base in Morocco. A recent U.S. Air Force declassification decision about the accident reminds us about the enduring unnecessary secrecy. The Air Force exempted the location of the accident, citing the Atomic Energy Act to justify the secrecy notwithstanding the departure of nuclear weapons and the U.S Air Force from Morocco nearly fifty years ago. Recognizing that such secrecy is obsolete, the presidentially appointed Public Interest Declassification Advisory Board has made useful recommendations that could correct it. For many years during the Cold War, the U.S. government deployed nuclear weapons around the world, on land and sea, from Atlantic Ocean to the Pacific Ocean and the Mediterranean, from Western Europe to East Asia. Some weapons were for battlefield purposes, others were deployed on aircraft carriers or at overseas air bases so that nuclear bombs would be closer to their targets in the former Soviet Union. In 1951 the French government granted access to territory in Morocco, one of its colonies, for U.S. air bases. At four Moroccan bases, the U.S. Strategic Air Command deployed B-36, then B-47, bombers and by 1954 was storing entire nuclear weapons (unbeknownst to the French). This basic information, disclosed in an Institute for Defense Analyses history (see pages 31, 33, and 76), has been in the public record for decades. After Morocco became independent in 1956, local nationalistic pressures made it a matter of time before all foreign military organizations had to depart, and by the fall of 1963 SAC had closed its bases. The B-47 fire was a classic nuclear accident in the “Broken Arrow” category and basic facts about it have been known for years. In response to journalistic queries and subsequent pressure from nuclear weapons researcher Robert S. Norris, then working with the Center for Defense Information, the Defense Department released, and later updated, reports on nuclear weapons accidents from 1950 to 1980. The CDI published the Pentagon report with more information to put it in context. The Defense Department cited the incident on 31 January 1958 noting that the B-47 was making a simulated takeoff when one of the wheels failed and a fuel tank ruptured when the plane hit the surface. The conventional explosives on the weapons did not detonate but the meltdown of the bomb’s plutonium pit caused contamination in the area around the fire and on one of the fireman’s clothing. The burning of a nuclear weapon made the accident a “Broken Arrow” (the highest category short of an accidental nuclear explosion). The Defense Department did not identify the location but Norris correctly surmised that the incident took place at Sidi Slimane. During President Bill Clinton’s massive release of the archival backlog in the late 1990s, some documents on the 1958 accident became available in State Department records at the National Archives (see documents A and B). The documents shed light on the State Department reactions to the accident, which included telling King Mohammed what happened but no public confirmation of the nukes and that evacuating the base might have been an overreaction. Other documents remained classified in a State Department file on “Aircraft Carrying Nuclear Weapons: a. Accidents 1958 and 1960.” Nearly 20 years after the National Security Archive filed a FOIA request for the documents, a delay which in itself is a scandal, the Headquarters of the Air Force Global Strike Command withheld five pages of documents in their entirety. According to the Strike Command, releasing the documents would reveal information on “military plans, weapons systems, or operations.” Surmising that the documents related to the B-47 accident in Morocco, the Archive appealed the decision noting that public record information on it had been available for years. In February 2013, the Global Strike Command granted the appeal in part by releasing the substance of the documents (see C, D, and E) which provided detail on how Air Force Chief of Staff Thomas White communicated the news of the accident to the State Department (a crash involving “one of those things”), the Air Force’s proposed press release which the State Department rejected (see document A), and the clean-up at the accident site. Nevertheless, citing the Atomic Energy Act (unmentioned in the first denial) the Strike Command withheld the particulars of the accident’s location. 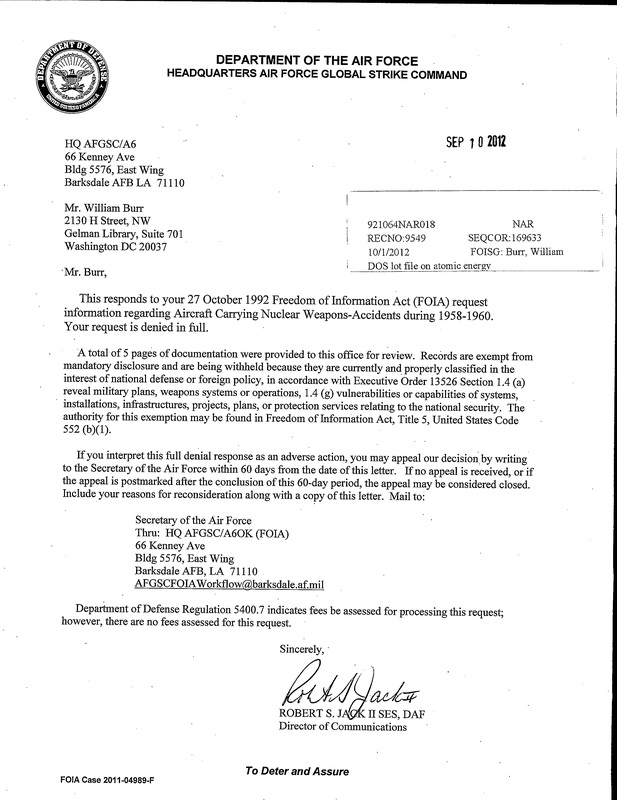 Even though it had occurred decades ago and U.S. military presence in Morocco ended in 1963, under the Atomic Energy Act, U.S. government agencies routinely treat information about the locations of nuclear weapons, even if they have been overtaken by events, as “formerly restricted data” concerning the military utilization of nuclear weapons,[i] which is extremely difficult to declassify. This requirement has hampered the release of considerable information about the historical locations of U.S. nuclear weapons and delivery system, whether it concerned the deployment of U.S. nuclear weapons in Canada (which ended decades ago) or Jupiter missiles in Turkey (whose withdrawal was an element of the Cuban missile crisis settlement). Even though President George H. W. Bush ordered the withdrawal of thousands of nuclear weapons from overseas in 1991 leaving only a few hundred weapons in NATO Europe, the Atomic Energy Act is an important element of the secrecy which has prevented official U.S. disclosure of the historical country locations of these weapons. A recent report by the Public Interest Declassification Board includes a number of useful proposals that could lead to a more rational declassification system. . Drawing upon earlier PIDB recommendations one of them directly addresses the problem of “formerly restricted data”. Acknowledging that “historical FRD information … is often obsolete and no longer has any military or operational value” and that “existing processes” have gotten nowhere, PIDB suggested a way out. FRD could be converted into “national security information” or where appropriate into restricted data. If information on the historical locations could be treated as NSI, it would allow the State Department or the Defense Department or other agencies to declassify it on a case-by-case basis. PIDB did not spell out what it would take to carry this out, but it would probably require a presidential decision. The president could instruct the departments of Defense and Energy, with the assistance of the National Security Staff, to reach an agreement on ways and means to implement to convert FRD into NSI and the general parameters for any declassification. Once an understanding is reached, it could be codified through an executive order. Unless this is done, the Air Force and other agencies will continue to redact obsolete information about Cold War nuclear deployments. [i]. “Restricted data” generally concerns the design of nuclear weapons and technologies for producing fissile materials, while “formerly restricted data” is a special category created after World War II when policymakers realized that military personnel needed access to nuclear weapons information so that they could make plans and arrangements for military use. FRD includes information such as weapons yields, stockpiles, and the locations of the weapons. ← Kim Jong Un: Following in his Father’s and Grandfather’s Footsteps, or Charting New Seas? The congressional committees that have jurisdiction over the Department of Energy (DoE) appear to be the Committee on Energy and Natural Resources in the Senate and the Committee on Energy and Commerce in the House. It may be time to approach members of these committees about clarifying the Atomic Energy Act of 1954 to specifically exclude DoE authority over purely military and diplomatic concerns such as the type, quantity, and location of nuclear weapons. The chair of the Senate committee is Senator Ron Wyden (D-OR). Also, has the current leadership in the Department of Defense and the incoming Secretary of Energy been approached about this? Given the general dysfunction of Congress of the last few terms, in particularly around the DOE and national security issues in general, I don’t really see any kind of obvious legislative solution. Re-doing the Atomic Energy Act’s information control clauses would require a lot of political work… it’s hard to imagine it happening. As you can see, the other categories were built with clear “outlets” in mind. FRD, not so much. I wonder if turning FRD to NDI would involve broad conceptual issues relating to the incompatibility between the RD and NDI systems. I haven’t thought about that specific problem much. Personally I think that the RD system might no longer make a lot of sense, if it ever really did — should nuclear technology have an entirely separate and parallel system of classification compared to all other secrets? (Including other weapons secrets, like BW and CW.) It seems a little out of date. I’ve talked about this with people who have worked on the intersections of RD and NDI and they sometimes think that the answer is still “yes they should be kept separate and parallel, because nuclear technology is still worse than anything else out there.” I don’t really think the RD system (and its differences from NDI) bring any more security, though. I lived at Sidi Slimane when this happened and remember it well. My Dad was Army Corps of Engineers there to build air strip. Since this was an Air Force Base we were not put in regular housing. We lived at the Motor Pool in a house built out of 11 dallas huts. Dad’s office was a quonset hut 15 feet from our front door. We used to ride our bikes on the runway on Sundays. The day of the evacuation I was in school – 2nd grade. We were let out and told to go straight home. There were vans driving around the base telling everyone we were being evacuated. We were the last to leave as it was Dad’s responsibility to make sure everyone was off before us. Mom kept suitcases packed with clothes and food for these types of situations. We went to Port Lyautey and I don’t think we even spent the night. Anyway, what is interesting to me now that I have read what actually happened and that there might have been some radiation leaked. We had to take our pee to school in a jar to be tested. I don’t remember anyone ever telling us what they were testing for. Being in 2nd grade, I didn’t know how unusual it was for kids to take pee in a jar to SCHOOL!!! But maybe this is the reason why. We were being tested for radiation! I’d sure like to know. You were being tested for radiation. In fact, you should have yourself checked now. My father was onsite working the incident and was still getting gama readings at the time of his death in 1991. I would love to receive any information anyone has on this particular incident. My father was Navy EOD UDT Team 2. Two teams worked this incident. Team 1 and Team 2. Team 1 received the Navy and Marine Medal of Honor and Team 2 did not. I want to see that they receive the recognition. I was at Sidi Slimane when this happened as well, an 11-year-old 5th grader. My parents also had positions of responsibility & insisted I evacuate with people that I barely knew because they had to stay behind…it was a truly terrifying experience. Years later I met a man who had been in the Navy when this happened. He told me that the plane & the contaminated area surrounding it had been loaded on a ship, brought back to the states, & buried under a hanger — he’d participated in the mission so knew firsthand. I wasn’t told at the time that there had actually been any contamination at all. I don’t remember taking a urine sample to school but I was several miles from the flight line so maybe I wasn’t at risk. What I remember most is the massive cloud of black smoke that followed us all the way to Port Lyautey. Seems that we evacuated in the direction the wind was blowing. I went from being a nervous Cold War kid to being an EXTREMELY nervous Cold War kid! We were at Nouasseur in early 1960 when we were taken out of school before lunch and sent home with no explanation, I was in 4th grade and didn’t care anyway, but I remember the adults seemingly very nervous. the reports self inflicted gunshot to head. Family could never understand. Wonder who was flying that plane that day? My Grandfather was Major Joseph Harry Jacoby died at GR AF on August. He shot himself in the head while stationed there. Family could never understand the suicide. Who was the flight crew on that plane that day?